Many U.S. and European diplomats contrast Fatah's Palestinian nationalism with Hamas's Islamism. At a November 28, 2007 press conference, U.S. national security advisor Stephen Hadley praised Fatah leader Mahmoud Abbas and cited President George W. Bush's argument that "Hamas, Hezbollah, and Al-Qaeda [are] different faces of the same evil: a radical ideology seeking to impose its world-view throughout the Middle East and beyond." But, while Fatah, the core of the Palestine Liberation Organization (PLO), may have its roots in the revolutionary, secular-oriented ideologies of the 1960s and 1970s, Islamist discourse is also integral to the movement. Indeed, even as Western diplomats seek to bolster Fatah's Abbas as an alternative to Hamas, they underestimate the degree to which Palestinian nationalism now intertwines itself with Islam. Since the 2000 Palestinian uprising, Fatah has fused national and religious symbols in order to use Islam as an instrument of mobilization. In the 1970s, Fatah graphic art promoted the culture of armed struggle which was at the heart of Fatah's ideology. (See Figure 1.) This enabled Fatah to mobilize the masses in the absence of a solid ideology among the divided and faction-ridden Palestinian society. Its imagery and texts sanctified violent struggle as the miracle cure for Palestinian problems. From the everyday struggle, they believed, would grow the formulas and theories for their ideology in the future. Figure 1: Armed struggle graphic art in 1970s spirit with the slogan: "Victory is ours." Before the outbreak of the second intifada, a Palestinian public opinion survey (conducted between November 1997 and March 1999) revealed that 87.6 percent of Fatah supporters believed Islam should play a major role in the future life of Palestinian society, and 80 percent said that any future Palestinian state should be run according to Islamic law. Fatah was the dominant political movement in the West Bank and Gaza from the Oslo-sanctioned return of PLO leader Yasir Arafat in 1994 until at least 2000. In September 2000, the Palestinians launched an uprising and unleashed a wave of terrorist attacks, which they named the "Al-Aqsa" intifada. Fatah re-branded its armed wing—previously known as the Storm, Al-'Asifa—calling it Al-Aqsa Martyrs' Brigades, a name chosen to bolster both Palestinian claims to Jerusalem and Fatah's religious claims. In one of the brigades' earliest proclamations, its members said they fought for independence, and national and religious values. Previously, Palestinian figures embraced the sectarian diversity of Palestinian Arabs, especially for the Western audience. For example, in a London press conference, Yasir Arafat said that "according to our religiousness, Christians should be mentioned before the Muslims," which was in the context of the suffering of the Palestinian people as a result of the intifada. But today Palestinian society emphasizes Muslim supremacy. Fatah expresses its new Islamist discourse not only in educational and cultural terms but also in its embrace of suicide bombing—"self-martyrdom" (istishad)—as a tactic. Figure 2: Proclamation in memory of Suhail ‘Ali Bakr. Fatah has embraced Islamist discourse for several reasons. First, competition with Hamas led its leaders to invoke Islam as a way to create a system of symbols and images that, combined with the national struggle, would fuse past and present and pave the way to an ideal future. In the mid-1980s, Fatah established satellite groups with an Islamic appearance in response to the activities of Islamic Jihad. Then, as Hamas became a competitor in the run-up to and after the outbreak of the second intifada, Al-Aqsa Martyrs' Brigades printed a Qur'anic verse on their banner that read, "Fight against them! God will chastise them by your hands, and will bring disgrace upon them, and will succor you against them; and He will soothe the bosoms of those who believe." It is no coincidence that Hamas used the same verse on its proclamations during the first intifada. God has bought from the believers their lives and their money in exchange for Paradise. Thus, they fight in the cause of God, willing to kill and get killed. Such is His truthful pledge in the Torah, the Gospel, and the Qur'an—and who fulfills His pledge better than God? You shall rejoice in making such an exchange. This is the greatest triumph. There still exists a group in my nation that preserves its religion, vanquishes its enemy, and is not harmed by any one who attacks it, and its people are the victors, due to God's strength. It was said [to the Prophet Muhammad], "O Messenger of God, where are they and who are [these people]?" The Prophet answered: "They are in Jerusalem and its surroundings, and they are at the forefront until Judgment Day." In many ways, Arafat paved the way for the growth of Islamism within Fatah. Second, given Israel's military dominance, Fatah may have embraced Islamism to counterbalance its technological weakness. Faith can be a useful counterweight to science and technology. During the Iran-Iraq war and in subsequent Arab suicide bombing campaigns, Islam provided the motivation for young fighters to confront technologically superior enemies, which conventional forces usually refrain from fighting. Third, Islam may have provided a useful glue to overcome factionalization within Fatah. The second intifada left Fatah beset by internal divisions and rivalries. The clan and sub-clan nature of Palestinian-Arab society compounded the problem. Arafat empowered the biggest clans and extended families as a counterweight to the rising, young, local leadership from the "new middle class." Bodies which rely on a sub-national identity in the broader framework of a national movement need an additional element to broaden their power base. Islam provided a useful mechanism by which to hold the clans together. Islam also provided Fatah a much-needed makeover. Implanted as a political entity in the West Bank and Gaza after the 1993 Oslo accords, by 2000, Fatah was associated with corruption in the minds of many Palestinians. An Islamist patina enabled Fatah to create an image of incorruptibility, purity, and devotion to jihad. The Oslo process enabled the Palestinian Authority to develop a formal armed force. Arafat built ten separate security apparatuses, each headed by loyalists. For example, Amin al-Hindi led General Intelligence, and Faisal Abu Sharkh led Presidential Security. 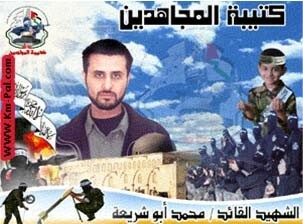 On September 28, 2000, followers of Marwan Barghouti, a West Bank Fatah leader convicted on May 20, 2004, of five counts of murder, formed the core of Al-Aqsa Martyrs' Brigades. The brigades' operations are decentralized, in part because of the tension between the young guard, born in the West Bank and Gaza, and Fatah's old guard, who spent most of their lives overseas. Islam provided a bond to hold the factions together and, unlike Palestinian nationalism, also allowed the group to establish links to non-Palestinian movements under the banner of Islamic solidarity. Zakaria Zubaydi, the chief commander of Al-Aqsa Martyrs' Brigades in the Jenin area, for example, said that his group receives funds from Hezbollah. The change in the discourse can be seen in the case of the Fatah Hawks who, during the first intifada, both spearheaded the Fatah fight against Israel in the Gaza Strip and fought against Hamas activists. The Hawks, who had earlier represented themselves as a national element fighting against the extreme Islamist movement, today boast that, upon "God's great name," they "will protect the beautiful Islamic land of Palestine." Hawks' communiqués abound in Islamic discourse. Reference to "pure soil" is also a frequent motif in Hawks' statements as the group seeks to claim the land of Israel as exclusive Muslim property. Their statements often speak about "the Arabic and Islamic people," tying Fatah to a struggle greater than just Gaza and the West Bank. 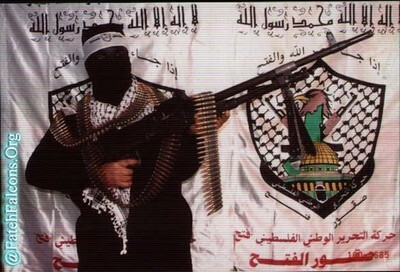 Figure 3: A Fatah gunman in front of a banner including the Hawks' symbol and the Muslim profession of faith. On their shield, the Hawks also use visuals, such as the Dome of the Rock, which reflect Palestinian folklore as national symbols. From the dome arises a map of Palestine, incorporating all of Israel and colored green to represent Islam. (See Figure 4.) That the map rises from the dome suggests a reference to Muhammad's nocturnal ascent to heaven. While the Qur'an does not mention Jerusalem, and the Arabs built Al-Aqsa mosque more than fifty years after Muhammad's death, Muslims commonly consider it the site of Muhammad's night journey to heaven. Above the image is a Qur'anic verse, "When God's Succor Comes, and Victory." The Arabic term nasr, which appears at the pinnacle of the Fatah shield, has two meanings: "salvation" and "victory." Fatah seeks to intertwine the two even further with its slogan, "Revolution until Victory" (thawra hata' an-nasr). Figure 4: The Fatah Hawks' symbol. The Shahid Ahmad Abu'r-Rish Brigades, a Fatah faction centered in the Khan Yunis and Rafah areas, also accord Islam a central role. The brigades acknowledge a close relationship with Hamas based both on shared religious principles and on having fought together "in the trenches against the enemies of the motherland and religion." On their Internet site, they call themselves Ansar al-Islam (Supporters of Islam), an expression that refers to the companions of Muhammad in Medina. 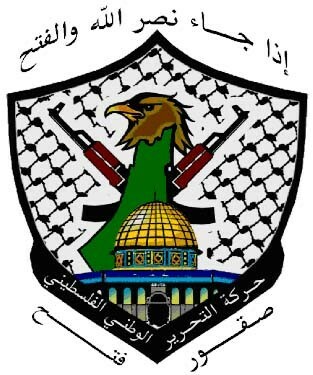 The Abu'r-Rish Brigades declare their aims to be not only the liberation of Palestine but also exaltation of God and flying the flag of Islam. They explain, "We believe that Allah is God, and Islam is our faith, for the Prophet is a model and teacher for us, for our way is the way of the jihad for the sake of Allah." This slogan, which mirrors one used by the Muslim Brotherhood, is now a staple of Fatah demonstrations in the Hamas-ruled Gaza Strip. They also use the Arabic hijra calendar. On an earlier home page, the brigades appealed to religious emotion, portraying the Qur'an and the Dome of the Rock on a green background. This page was shut down by the Canadian government in mid-2006 after a Canadian court accused the Abu'r-Rish Brigades of terrorism. Like their mother organization, the Fatah Hawks, they created a motif of a map of undivided Palestine in green above the Dome of the Rock, denoting the whole of Palestine as a waqf, or religious endowment. Crossed Kalashnikov rifles signify fulfillment of the goal of liberating the land through jihad—through armed struggle against the Israeli presence. The Abu'r-Rish Brigades forbid any Western solution involving compromise with Israel. They mix classical Fatah discourse describing Israel as a branch of Western imperialism with Islamic terminology and suggest jihad to be the only solution to the Palestinian question. This policy is reflected in the Qur'anic quotes: "O ye who believe! Take not the Jews and the Christians for your friends and protectors. They are but friends and protectors to each other." By this quote they portray themselves as a nationalist-Islamic force that stands against the "imperialist-infidel" conspiracy to divide Palestine. The Clear Victory Brigades, whose name in Arabic derives from the Qur'an, call for the continuation of the struggle by means of the word and the rifle and seek both moral reckoning and the preservation of social values now in decline. The use of names indicating the Islamic roots of Fatah falls into a pattern reminiscent of the first intifada when the political struggle between Fatah and Hamas was expressed in part through Fatah graffiti bearing a religious complexion: "Allah is my Lord; Islam is my faith; the Qur'an is my book; to the Ka‘ba, I turn in prayer; Muhammad is my prophet; Fatah is my movement," or "There is no god but Allah—thus we have always believed (Fatah, Nablus)," and "Fatah everywhere—even in the Qur'an." 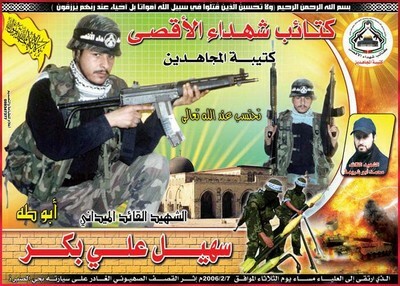 Figure 5: Poster of Muhammad Abu Shari‘a, from the Holy Warriors Brigade. The Pioneers of the Army of the People—The Brigade of the Return—is another clear example of the mixing of religious and national symbols. Its banner also features a green map of repartition Palestine and an image of the Dome of the Rock with crossed rifle-barrels. Accompanying the banner is the Qur'anic verse, "Kill those who fight you everywhere." Its members devote themselves to liberation of land "completely under the aegis of God and in the fulfillment of His commandments." The picture of an activist of the faction sitting on what appears to be a rostrum reflects the depth of the blending of the symbols (see Figure 6): Behind the activist hangs a Palestinian flag decorated with the Muslim profession of faith, next to which is the logo of Al-Aqsa Martyrs' Brigades. A Pioneers of the Army of the People flag covers the table. 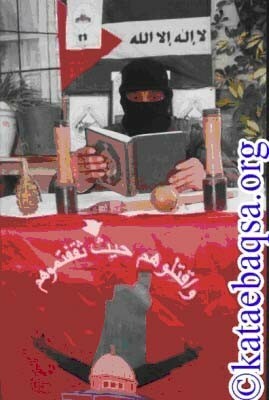 The activist himself chose to be photographed reading the Qur'an with weapons placed beside him. Figure 6: Image from the group Pioneers of the Army of the People, The Brigade of the Return. Despite their internecine struggles for prestige, all of these Fatah factions duplicate certain symbols: the Dome of the Rock and a green map of Palestine. Quotations from the Qur'an cement the link between religion and Palestinian nationalism. Yunus Karim, a senior Fatah member imprisoned in Israel for twenty-five years for the murder of an Israeli soldier, complained that the new generation of Fatah fighters know about jihad but only learn about Fatah's philosophy when in prison. Fatah imagery chronicles the Islamization of the movement. 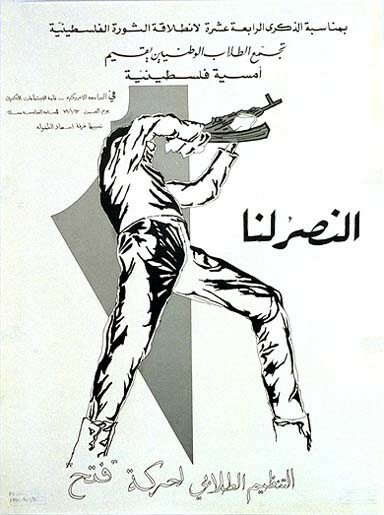 In the 1970s, Fatah graphic art dedicated itself to promoting the culture of armed struggle, which, at the time, was the heart of the movement's ideology. Today, the gap between Fatah and Hamas in terms of the role of Islam has narrowed. Fatah is more likely to see Islam as one component of national identity while Hamas preaches the primacy of Islamic identity, but both agree that Palestinian society should be Islamist. Fatah leaders may try to keep their movement distinct, not by reversion to its secular past, but rather by arguing that its version of Islam is less extreme than that of Hamas. It is not a coincidence that Fatah organized mass prayers in public areas in the Gaza Strip to protest against Hamas policies. Fatah's loss to Hamas in the January 2006 parliamentary elections, though, forced it to externalize its Islamism. This may further a trend within the West Bank and Gaza—as well as, perhaps, in Jordan—toward Islamist radicalism. It is no surprise that Fatah chairman Mahmoud Abbas recently attended Friday prayers at his Muqata‘a mosque, accompanied by the political leadership of Hamas in the West Bank. To preserve his legitimacy, as well as national unity among Palestinians, Abbas must strengthen the Islamic elements in his political behavior. Fatah has deepened its own Islamic terminology and now preaches on the importance of prayer and faith in God during training and indoctrination of its new members. Fatah has also started a propaganda campaign accusing Hamas of being a servant of Iranian interests and Shi‘i supporters, thereby using Islam to criticize its rival. Fatah's new religiosity cannot easily be undone. It is ironic that while many Western diplomats now turn to Fatah as an alternative to Hamas's Islamism, the real Fatah is much closer to Hamas while the secular Fatah now appears to be a relic of the past. Ido Zelkovitz is a Ph.D. candidate in Middle Eastern History at Haifa University. Stephen Hadley, remarks at Johns Hopkins University, Paul H. Nitze School of Advanced International Studies, Washington, D.C., Nov. 28, 2007. Yezid Sayigh, Armed Struggle and the Search for State: The Palestinian National Movement, 1949-1993 (Oxford: Clarendon Press, 1997), p. 91. Rafiq Shakir an-Natsha, Al-Islam wa-Filastin (Beirut: Manshurat Filastin al-Muhtalla, 1981), p. 17. Nels Johnson, Islam and the Politics of Meaning in Palestinian Nationalism (London: Kegan Paul International, 1982), pp. 65-6, 77-86; Saqr Abu Fakhr, Al-Haraka al-Wataniya al-Filastiniya: Min an-Nidal al-Musallah ila Dawlat Manzu'at as-Silah (Beirut: Mu'assasa al-‘Arabiya li'd-Dirasat wa'n-Nashr, 2003), pp. 26-9. Emanuel Sivan, Hitnagshut be-Tokh ha-Islam (Tel Aviv: ‘Am ‘Oved, 2005), pp. 190-2 . Fawaz Turki, Soul in Exile: Lives of a Palestinian Revolutionary (New York: Monthly Review Press, 1988), p. 53. "Political Beliefs and Preferences of People Who Trust Fatah and People Who Trust Leftist Factions," Analysis of Palestinian Public Opinion on Politics, Jerusalem Media and Communication Center, Sept. 2000, p. 35. Kata'ib Shuhada' al-Aqsa, "Kilmat al-Kata'ib—Min Al-'Asifa ila Kata'ib Shuhada' al-Aqsa," accessed Nov. 21, 2007. Kata'ib Shuhada' al-Aqsa, "‘An al-Kata'ib," Sept. 21, 2005. Tony Blair and Yasir Arafat, news conference, Prime Minister's Office, Oct. 15, 2001. Ronni Shaked and Avivah Shabi, Hamas: Me-emunah be-Allah le-derekh ha teror (Jerusalem: Keter, 1994), pp. 204-6; Meir Hatina, Islam and Salvation in Palestine (Tel Aviv: Moshe Dayan Center, Tel Aviv University, 2001), p. 69. See Hamas proclamations, nos. 3, 5, and 7, in Shaul Mishal and Reuven Aharoni, eds., Avanim zeh lo ha-kol: ha-Intifadah ṿe-nesheḳ ha-keruzim (Tel Aviv: Hakibbutz Hameuhad and Avivim, 1989), pp. 202-13. Hillel Frish, "Nationalizing a Universal Text: The Quran in Arafat's Rhetoric," Middle Eastern Studies, May 2005, pp. 322-5. Munazzamat at-Tahrir al-Filastiniyya, Rasail al-Akh Abu A'mmar Ra'is al-Lijna at-Tanfidhia li-Munazzamat at-Tahrir al-Filastini—Al-Qa'id al-‘Amm li-Quwwat ath-Thawra al-Filastinyya ila Abtal al-Quwwat al-Mushtarika wa-Jamahir ash-Sha‘bayn al-Lubnani wa'l Filastini fi'l-Harb as-Sadisa, Wathiqa 1-2-3-4-5 (n.p., n.d.), pp. 23-40. Al-Hayat (London), Oct. 5, 2002, in Middle East Media Research Institute (MEMRI), Special Dispatch Series, no. 428, Oct. 11, 2002. Ephraim Lavi, "Zehoyot Kibotziot Mitharot be-He'ader Medina Leomit," paper delivered at "The Solidarity of the Arab State—Is It in Decline?" conference, Moshe Dayan Center, Tel Aviv University, Mar. 21, 2006. Michael Milstein, Fatah ve-Hareshot Hafalastinit Bein Mahapekha le-Medine (Tel Aviv: Moshe Dayan Center, Tel Aviv University, 2004), p. 57. Fabio Forgione, "The Chaos of the Corruption: The Challenges for the Improvement of the Palestinian Society," The Palestinian Human Rights Monitoring Group Report, Jerusalem, Oct. 2004. Gal Luft, "The Palestinian Security Services: Between Police and Army," Middle East Review of International Affairs, June 1999. Nigel Parsons, The Politics of the Palestinian Authority: From Oslo to Al-Aqsa (New York: Routledge, 2005), p. 154. Medinat Israel Neged Maerwan Iben Hatib Barghuthi (The state of Israel vs. Maerwan Iben Hatib Barghuthi), file no 1158/02, Beit Ha-Mishpat Ha-Mehozi Be-Tel Aviv, May 20, 2004. Anat N. Kurtz, Fatah and the Politics of Violence: The Institutionalization of a Popular Struggle (Eastbourne, U.K.: Sussex Academic Press, 2005), p. 140. Ar-Ra'y al-‘Amm (Kuwait), Mar. 6, 2004. Rema Hammami, "From Immodesty to Collaboration: Hamas, the Women's Movement, and National Identity in the Intifada," in Joel Beinin and Joe Stork, eds., Political Islam: Essays from Middle East Report (Berkeley and Los Angeles: University of California Press, 1997), pp. 204-6. Sukur al-Fatah, ‘Ashat Dhikra al-Marid al-Fathawa'i, Jan. 1, 2005. Hatina, Islam and Salvation in Palestine, p. 66. Daniel Pipes, "The Muslim Claim to Jerusalem," Middle East Quarterly, Fall 2001, pp. 49-66. Kata'ib ash-Shahid Ahmad Abu'r-Rish, Hawla Mushkilat Kata'ib ash-Shahid Ahmad Abu'r-Rish ma‘a Hamas (n.p. : Rabi'a al-Thani 4, 1426 A.H., May, 13, 2005). Sivan, Hitnagshut be-tokh Ha-Islam, pp. 190-2. Kata'ib ash-Shahid Ahmad Abu'r-Rish, "Min Nahnu-Nibadha Muhtasara," accessed Nov. 15, 2007. "Masirat Fatah fi Mukhaym al-Bureij," Sept. 20, 2007. Yusuf Sadik, "Kanada Taharib Kata'ib ash-Shahid Ahmad Abu'r-Rish," accessed Nov 28, 2007; Kata'ib ash-Shahid Ahmad Abu'r-Rish, "Iftitah al-Maktab al- I‘alami li- Kata'ib ash-Shahid Ahmad Abu'r-Rish Ba‘d Ighlaqahu mi qabal Jihat Sahyuniya-Kanadiya," Mar. 13, 2007. Fatah, "An-Nizam al-Assasi," Fatah Basic Order, first part, articles 7-8, accessed Nov. 12, 2007. "Kata'ib Fatah al-Mubin," n.p., 2005. Tariq Ibrahim and Muhammad Ibrahim, Sha‘rat al-Intifada (London: Filastin al-Muslima, 1994), pp. 265, 367-6. ‘Abu ash-Shaykh: "Afkhar inani Ibn li-hadha al‘A'ila wa-Fakdan ithnayn min ashiqqa'i la Yuharabuni'," accessed Mar. 12, 2006. Kata'ib Shuhada' al-Aqsa, "Bayan Na‘i min Kata'ib Shuhada' al-Aqsa wa- Talai‘ al-Jaysh ash-Sha‘bi- Kata'ib al-A‘wda: Al-Ab al-Qa'id Yasir A‘rafat fi Dhimmat Allah," Nov. 11, 2004. Yunus Karim, interview on Israeli Channel One, May 18, 2005. Lavi, "Zehoyot Kibotziot Mitharot be-He'ader Medina Leomit." Bakr Abu Bakr, Harakat Fath wa't-Tanzim Allathi Nurid (Ramallah: ‘Anah li't-Taba‘a wa'n-Nashr, 2003), p. 165. Al-Ta'amim (Fatah periodical, Ramallah), Aug. 2007. Al-Ayyam (Ramallah), Nov. 3, 2007. Bakr abu-Bakr, "Qiyam as-Sala wa-ikhtirak al-Gudur," accessed July 11, 2007. Fatah- al-I'alam al-Markazi, "M'ashal: Hamas al-ibn ar-ruhi lil-Imam Khumayni" (M'ashal: Hamas is the spiritual son of Imam Khomeini), accessed Aug. 21, 2007. Related Topics: Palestinians, Radical Islam | Spring 2008 MEQ receive the latest by email: subscribe to the free mef mailing list This text may be reposted or forwarded so long as it is presented as an integral whole with complete and accurate information provided about its author, date, place of publication, and original URL.